Laguna Beach is considered one of the premiere seaside destinations in California midway between San Diego and Los Angeles. Routinely voted as one of Southern California’s “treasures” of the Pacific Coast, this coastal community is home to famous artisans, historic Main Beach, world-renowned art festivals, and seven miles of picturesque beaches and surf. Laguna is a year-round retreat for beachgoers, nature enthusiasts, and art lovers. As the second oldest city in Orange County (Anaheim first), Laguna Beach is truly a “resort for all seasons.” This coastal community has a warm Mediterranean climate with ample sunshine all year. Daytime temperatures average 67°F (January) to 79°F (July). “It is bordered by the Pacific Ocean on the southwest, Crystal Cove State Park on the northwest, Laguna Woods on the northeast, Aliso Viejo and Laguna Niguel on the east, and Dana Point on the southeast. The land in and around Laguna Beach rises quickly from the shoreline into the hills and canyons of the San Joaquin Hills.” (Wikipedia- Laguna Beach, CA). This artist and beach community has been home to Laguna Shores’ buildings since the 1920’s. Originally, Laguna Shores was a seaside motel and half a century later it was converted into a timeshare property under the guidance of Raymond Aneas Watt, founder Watt Industries. Since its conversion, the vision for Laguna Shores has remained steady with the utmost care and compassion for this truly unique property, its team members, owners, guests, and historic community. 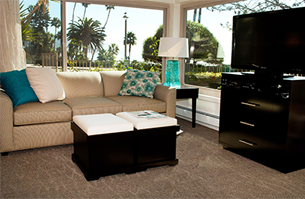 Laguna Shores is an award winning resort with casual, Southern California seaside décor and accommodations. Each suite is designed to welcome guests home to a relaxing retreat after a long day of surfing, shopping, boating, exploring or whatever activity Laguna Beach has to offer. The resort’s team warmly greets guests throughout their stay and plans numerous weekly activities, like complimentary movie nights with fresh popcorn. Laguna Shores is a vacation ownership resort with thousands of owners from all over the United States and foreign countries. The resort is operated by Tricom Management, Inc., one of the finest management firms that manage timeshare resorts throughout North America. Laguna Shores is one of the top timeshare resorts in Southern California thanks to the award winning team, loyal owners, dedicated Board of Directors, and professional management company, Tricom Management. For timeshare exchange questions, please contact Platinum Interchange. For rental inquiries which may also be booked by non-timeshare owners, Book Online.